Swapping engines: It’s a dream that has kept hot rodders dreaming–and building–for generations. Substituting powerplant A for powerplant B isn’t always a bolt-in process, though, especially when it’s a cross-pollination project. That’s when you need to break out the fabrication tools, as we did when installing a 1994 Mazda Miata driveline into a 1967 MGB, our latest project. So far we’ve made mounts for our engine and gearbox, modified our clutch pedal and hydraulics, and made the throttle work. It’s now time to get the accessories on the engine. In addition to the alternator, this car will eventually receive an Eaton M62 supercharger as well as an air conditioning compressor, so packaging will be pretty tight in the MGB’s narrower-than-a-Miata engine bay. 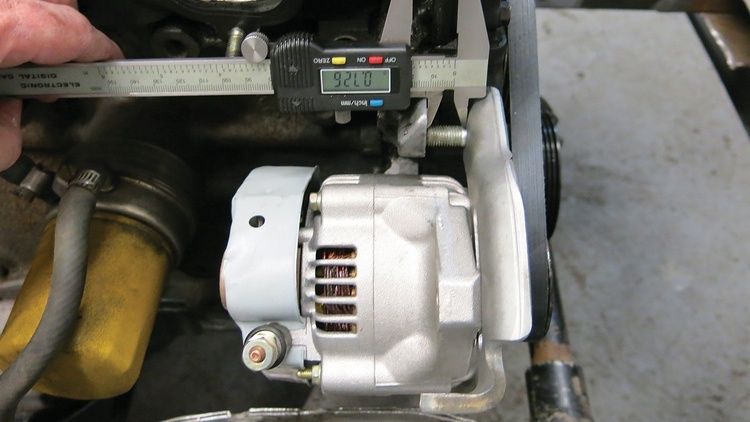 This issue we’ll cover how we mounted the alternator–which, we have to admit, was one of the tougher parts of the project. 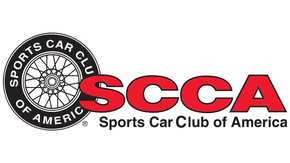 First of all, we had to compromise one of our guiding principles for the swap: Our determination to use only MGB or Miata parts to make future service easier. Since neither the MGB nor the Miata alternator would fit very well on our project, we ended up using a dimensionally smaller unit originally fitted to a Geo Metro. We could at least use the Miata belt. Even with that small alternator, the fit was tight. Not only did we want to physically hang the alternator on the car, we also wanted to do so while maintaining enough room so it could be easily serviced, adjusted and replaced. We made it all work, but it took some careful measuring, a few do-overs, and some creative problem solving. There’s a lot more to this series than just duplicating our swap. In theory, these lessons could help any swap that’s venturing into uncharted waters. That’s especially true of this installment: We’ve driven too many disappointing swaps that rattle, clatter and fall apart too quickly, and those issues usually originate from the accessory mounts. 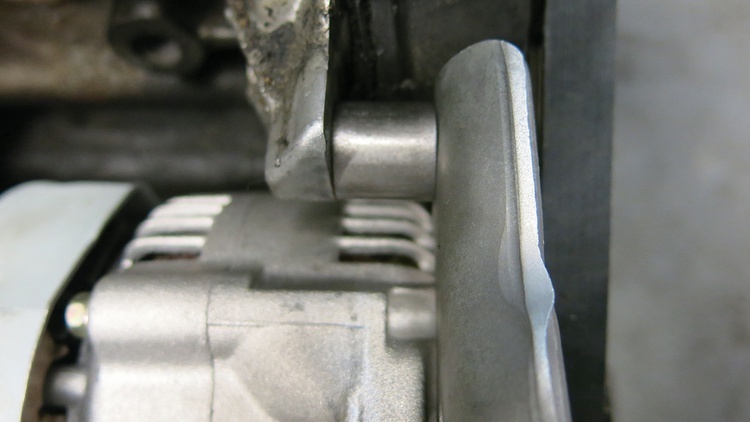 Engine transplants often end up with mounts that are stressed, misaligned, under-built or otherwise poorly done. Mounts have to be very sturdy: Accessory mounts see a lot of jarring and shaking, and they tend to crack or oval their holes if they’re not properly designed. We like to over-build ours. 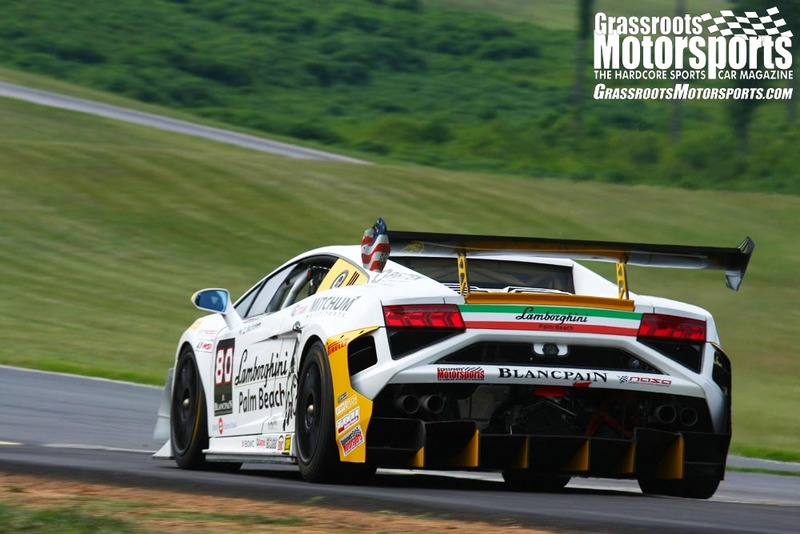 While we may take a 1 or 2 pound weight penalty, we prefer that to putting an accessory through the radiator. 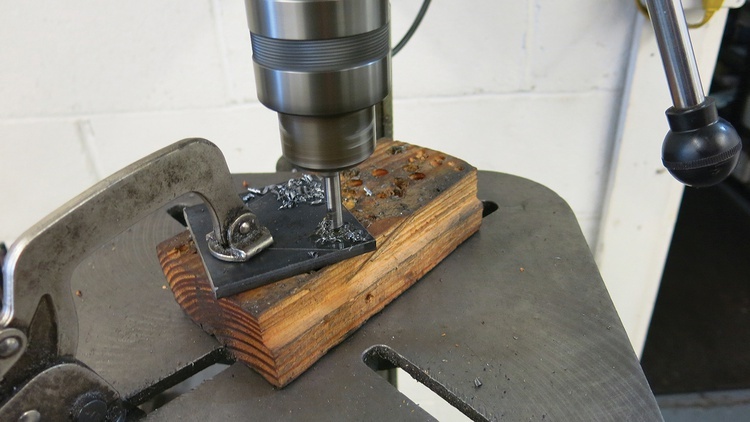 We like thick material–usually 1/4-inch steel or thicker–and we’re careful to smooth and radius everything to keep stress risers to a minimum. It’s also important to understand how the designers of the factory accessory mounts intended them to be used. We often see the wrong part of the accessory attached to a mount, or setups that don’t properly load the bolts. Finally, there’s the wiring. That’s usually an afterthought rather than a planned exercise. We’ll get to the wiring in a future installment, but first, here is how we solved our alternator mount conundrum. The factory Miata alternator fits low down on the right side of the engine block, while the MGB engine bay narrows down to a welded-on subframe–right where the Miata alternator would like to live. Notching the subframe would weaken it too much, and raising the alternator would lead to clearance issues with the intake manifold. We were going to need a smaller alternator for our swapped MG. 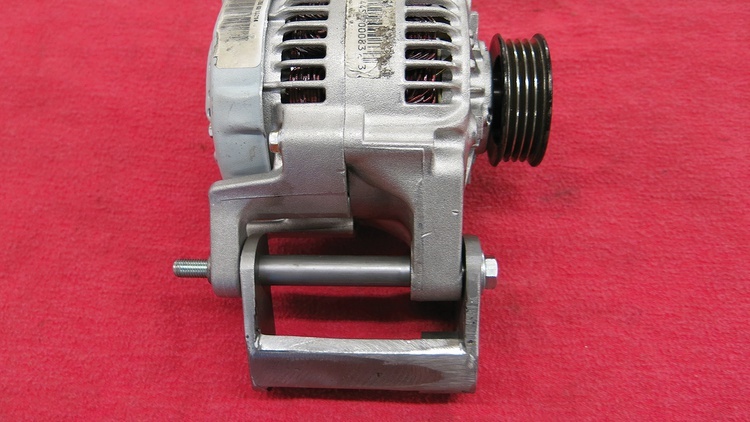 While one of our guiding principles with this swap is to use only MGB or Miata parts to make future replacements simpler, we had to compromise on the alternator and find something smaller. Many people like the various compact “one-wire” units available online, but we’ve found that these units' longevity is sometimes suspect. 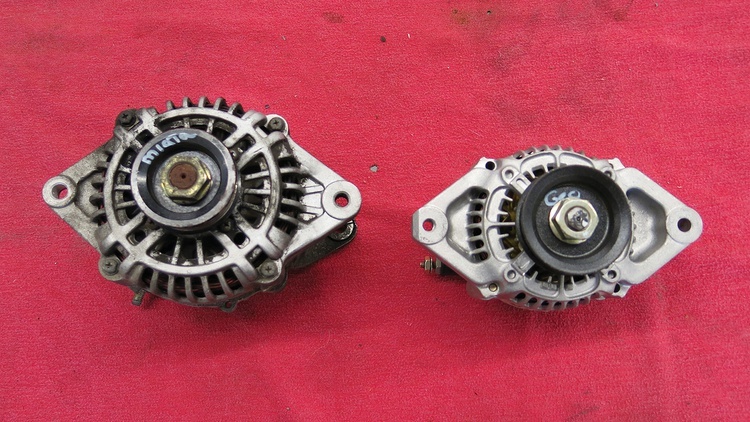 We prefer a traditional alternator with multiple wires and a provision for an idiot light. We also want an alternator that’s relatively easy to buy at a parts store. 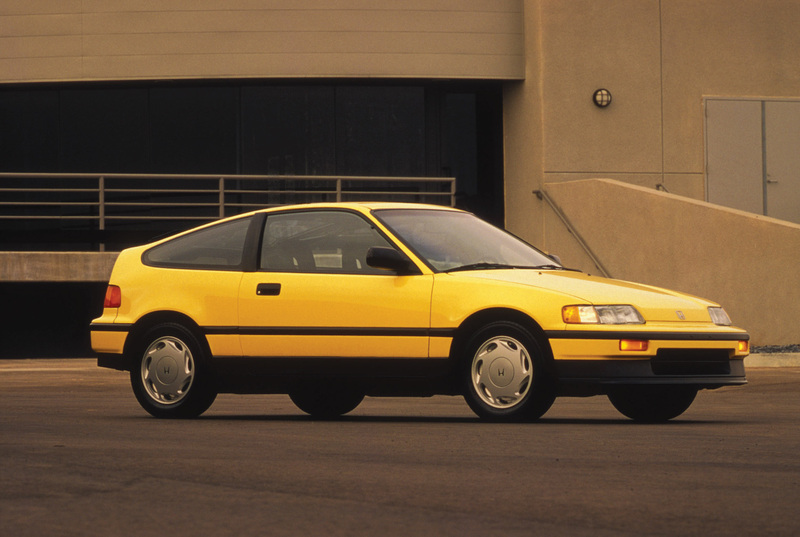 The answer was a Denso alternator designed for an early-’90s Geo Metro. It has the shape and 82-amp output needed for many of our projects. While the size of the Geo replacement alternator body worked for us, the pulley did not. The Geo uses a belt with one less rib, so it is too narrow for our Miata belt. To solve this, we just used the Miata pulley, but it has a larger shaft diameter. 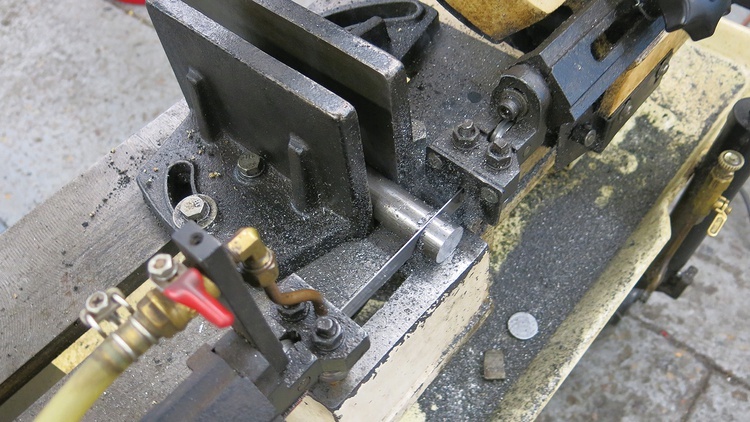 We had a machinist friend make up a bushing to adapt the pulley. We blocked the Geo alternator into the rough position and took enough measurements to pattern a mount. (Our favorite pattern material comes from file folders.) We then traced our pattern onto a piece of 1/4-inch-thick steel and used a spring-loaded prick punch to locate the three holes it needed. We could then drill our holes. 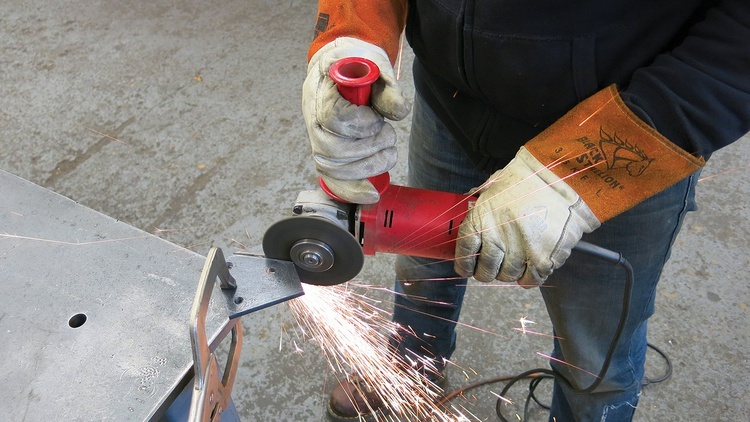 Next we rough-cut the bracket using a 4-inch grinder fitted with a 1/16-inch cutoff wheel. We now had a bracket that we could use for some test fitting. 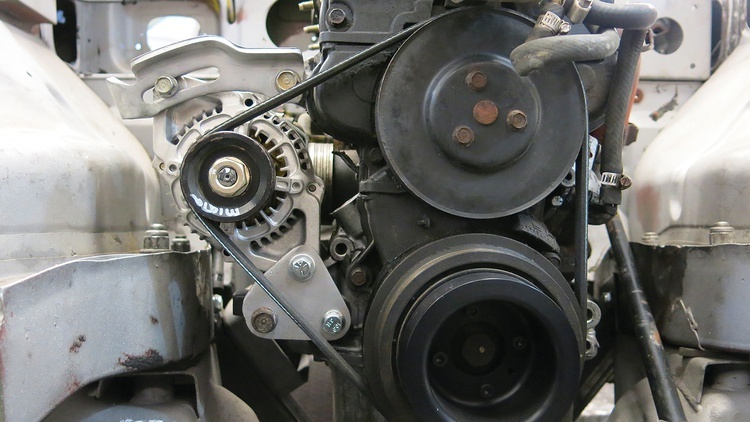 We bolted the alternator to this first part of the bracket, and spaced the bracket with washers until the alternator pulley was in perfect alignment with the water pump and crank pulleys. The washers that we used for the test fitting wouldn’t cut it for the final product. 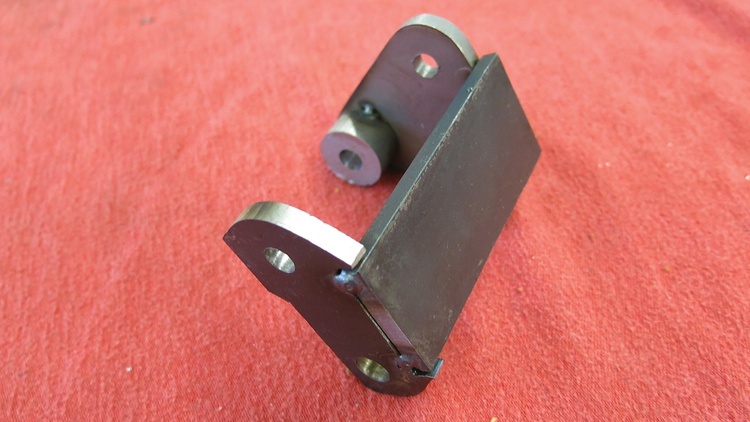 We fabricated a proper spacer out of 1-inch round stock. Then we drilled out the center. We tack-welded the spacers to the bracket and then started working on the back part of the piece. 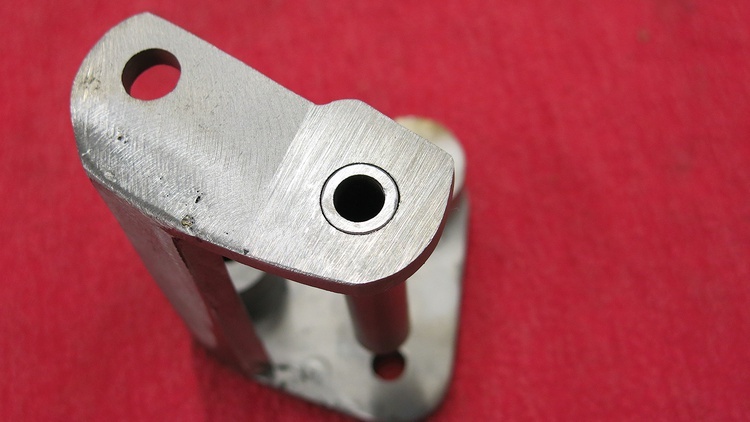 Using transfer punches, we marked the two holes that needed to align from the front to the back of the bracket. After some more drilling and shaping, we added a piece of steel to link the front and back of the bracket. Then it was time for more test fitting. Each time our bracket got a little closer to its final shape, the tolerances used during the test fitting mattered more. 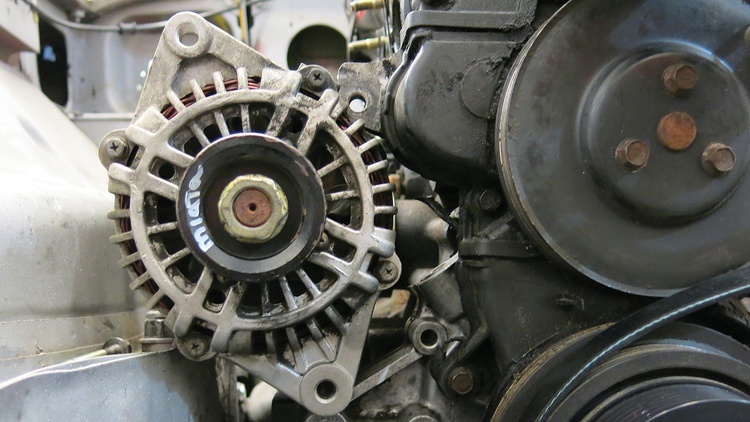 It’s helpful to have a really clear understanding of alternator mounts, and this picture shows an important detail: Most alternators have two ears that form the mount’s pivot point, and a long bolt then goes through these ears. 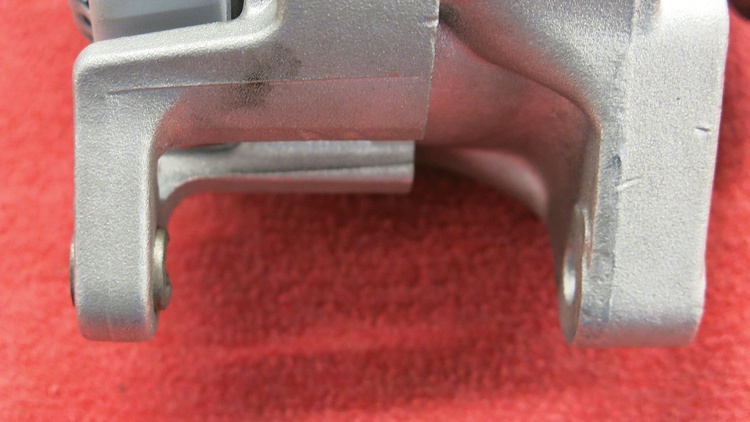 That bolt’s alignment is very important, as bending the ears will cause problems. Since manufacturing tolerances exist, most alternators feature a sliding piece on one of the ears–in this case the rear ear. That sliding piece is usually a large roll-pin that is pressed into the ear. 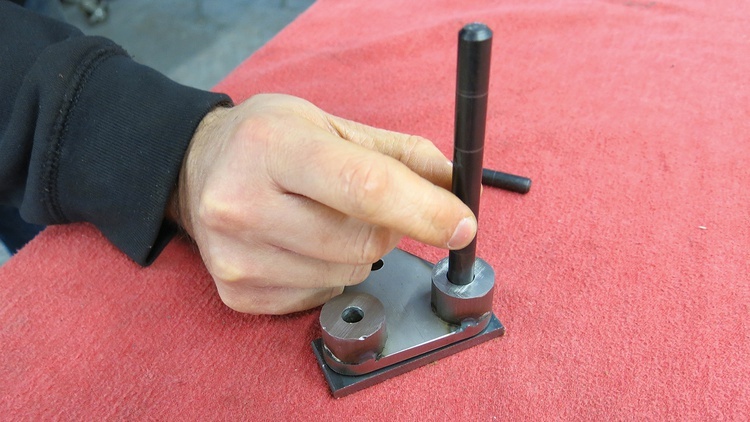 While the piece doesn’t slide easily, it does move when needed to create the proper tension on the mounting bolt. 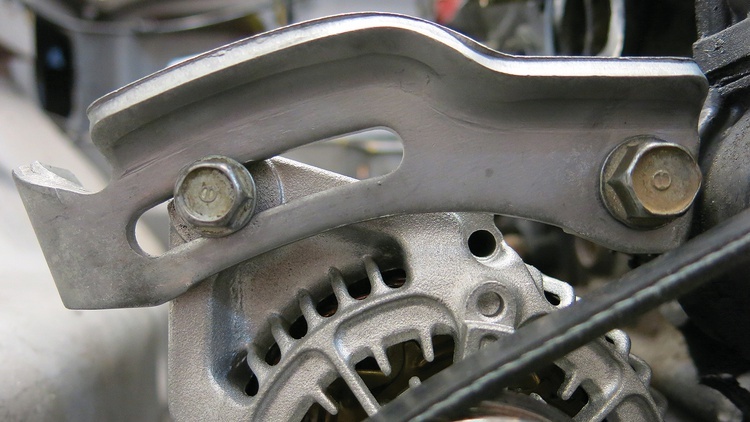 As we mentioned, the pivot part of the mount has to be designed so it won’t bend or break the alternator’s ears. 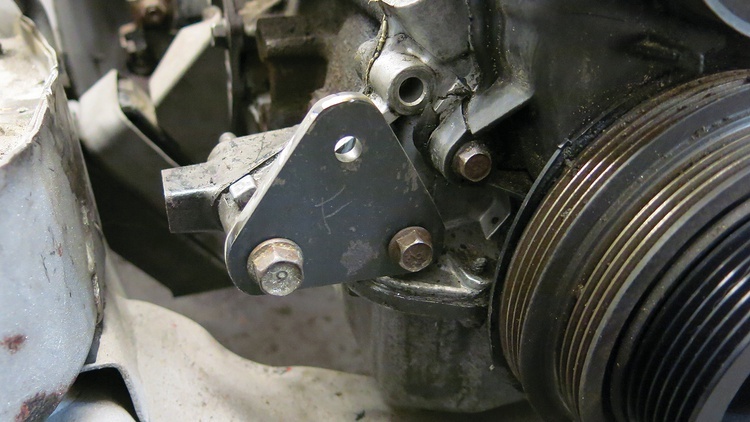 If one long bolt is used to mount the alternator, then a support must be placed between those ears. Without a support, either the ears will get damaged, or the bolt won’t stay tight. We made our support from a small piece of tubing. We drilled the bracket for an interference fit to the tubing that would let it slide slightly while keeping support between the ears and bracket. With the pivot side of the mount finished, it was time to address the adjuster bracket. 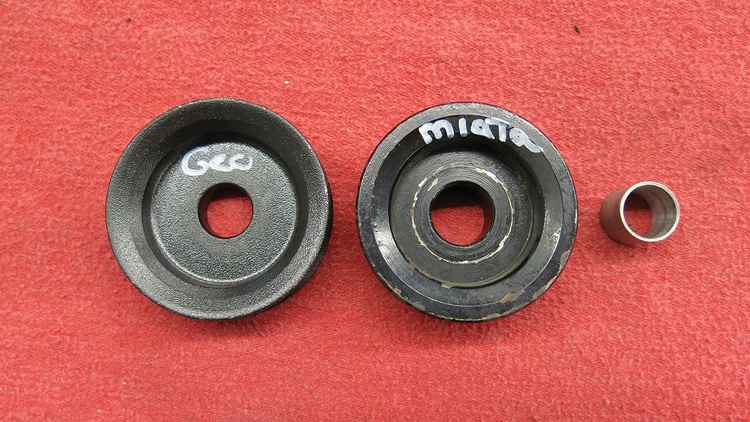 We were able to use the factory Miata piece, but it needed a spacer to bolt to the right position. We started that step by taking a measurement. Next we made a spacer from the same 1-inch stock that we used for our other spacers. We drilled a 10.5mm hole so its 10mm mounting bolt could easily pass through. We made sure that we had plenty of adjustment in either direction. In the end, we made a very sturdy mount that offers decent clearance in all directions. 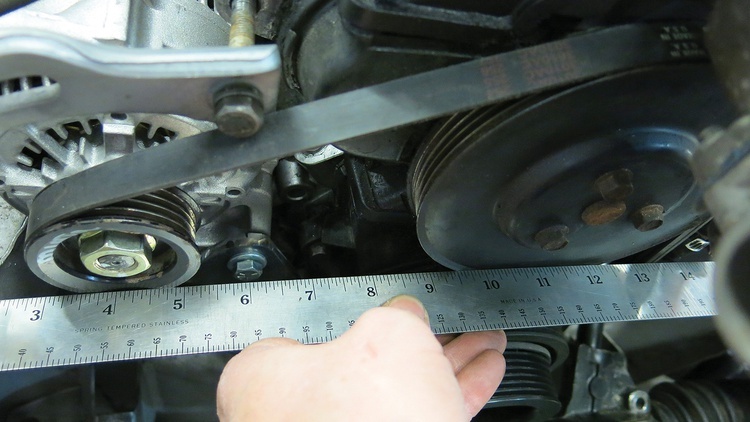 While we made a big compromise in using a Geo alternator, we’re glad that we could at least use the stock-length belt. We figured the belt is more likely to need replacement anyway, so we feel we made the right compromise. As we said at the beginning of this story, we had a few do-overs in this project. For the back part of the mount, it actually took us five tries to get a piece that we liked. 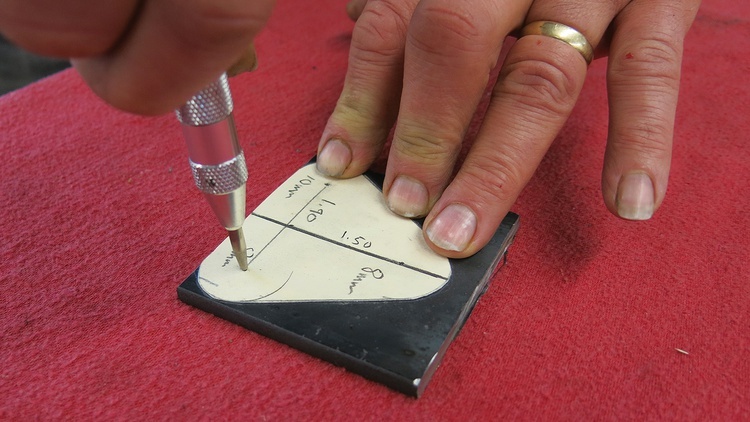 A couple of these efforts were just dumb–we copied the dimensions of the wrong holes (twice!) because we were too late-night loopy. The others were slightly different, as we were dealing with some very tight clearances. Just a quick reminder that not everything works right the first (or second, third, or fourth) time, but perseverance pays off. Loved the article, and the Geo Metro Alternator looks perfect for swaps into tight spaces. I'll look forward to the installment on wiring! Another reminder of how much I need a welder and to learn how to use it. Keep track of every part that goes into the build and compile them into a new "Owners Manul" supplement.booklet. One copy always in the glove box. 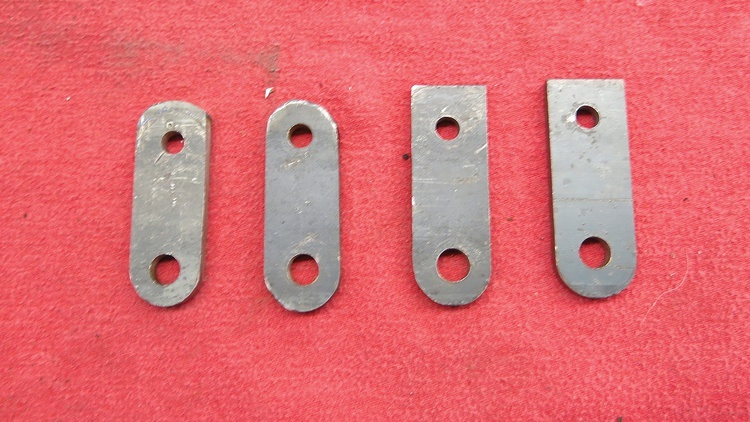 It's a bigger deal when your donor sources are alphabet soup, but even with a few simple pieces, it's always handy to have the part numbers at hand right when & where you need them.